The New York Times reports that some building manufacturing firms are moving into the nascent but growing green wall market. In the case of Barthelmes Manufacturing company, the firm is producing vertical metal panels that can be filled with soil and seeds. Green walls have some of the same benefits of green roofs. “Like green roofs, walls include a thick layer of vegetation on the outside of buildings to provide insulation and reduce heating and electricity costs.” In fact, Time Magazine listed green walls as one of the top 50 inventions of 2009, and cited Patrick Blanc's 8-story green wall on London's Athenaeum Hotel as an example (see ASLA's guide to green infrastructure for more on the benefits of green walls). 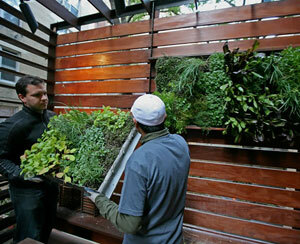 Green walls can also be used to produce food in dense urban areas. Using less space, edible walls can "produce fruit, vegetables and herbs." According to The New York Times, urban farming advocates see edible green wall systems as a way to "lower food costs, increase nutritional quality and cut fuel consumption and carbon emissions by using fewer delivery trucks." Larry Lehning, chief executive at Barthelmes, told The New York Times his sales of green products have doubled in the past year, and now account for 15 percent of the company's revenue. "The traditional metal fabrication industry is shrinking, and green is an emerging area." A number of firms are also developing self-contained vertical greenhouses, which often feature hydroponic systems, for producing food (see earlier post on Valcent Products). In the developing world, vertical farm sheds featuring hydroponic systems can help create healthier, more high-quality seedlings or animal fodder in rural areas (see earlier post). Other inventors are exploring combined edible wall, solar and aquaculture systems. Dickson Despommier, a professor at Columbia University, has been a leading proponent of vertical farming systems. Read an interview with Despommier. Also, note that Time Magazine listed vertical farming as one of its top 50 inventions of 2009 as well. Read the article and view a slideshow of edible walls. The Dirt Blog is a resource of the American Society of Landscape Architects. The Dirt provides up-to-date landscape architecture, sustainability and environmental news.